Switzerland (Lat. Helvetia; Ger. Scliweiz; Fr. La Suisse), a federal republic of central Europe, between lat. 45° 50' and 47° 50' N., and Ion. 5° 55' and 10° 30' E. It is bounded N. by Germany, E. by Austria and Liechtenstein, S. by Italy and France, and W. by France; and nearly the entire boundary line is formed by rivers (the Rhine and Doubs), lakes (of Constance and Geneva), and mountains (the Alps and Jura). In its greatest length it measures 210 m.; in its greatest breadth, 140 m. Switzerland is the most mountainous region of Europe, and, with Tyrol and Savoy, which border it on the east and southwest respectively, the most elevated. Even the most level part in the north presents mountains rising upward of 2,000 ft. It is covered throughout almost its whole extent by the Alps, of which the following groups, with their various branches, belong properly to Switzerland: 1, the Pennine Alps, separating the canton of Valais from upper Savoy on one side and Piedmont on the other; 2, the Lepontine or Helvetian Alps, including the divergent Bernese Alps, extending on both sides of the Rhone, and separating Switzerland from Lombardy; 3, the Rhaetian Alps, beginning at Monte Bernardino and extending along the frontiers of Switzerland, Italy, and Tyrol. (See Alps.) The principal Alpine summits in Switzerland, such as the Monte Rosa, Matterhorn or Mont Cervin, Finsteraarhorn, and Jungfrau, ranging between 15,200 and 13,700 ft., are treated separately under their respective names. To the west of the Alps, between France and Switzerland, extends the Jura range of mountains. (See Jura.) There are many points of view whence the semicircular array of peaks, presented at once to the eye, extends for more than 120 m., and comprises between 200 and 300 distinct summits, capped with snow or bristling with bare rocks. Of the heights commanding such panoramas, the Rigi is probably the finest and is one of the most accessible. (See Rigi.) The Faulhorn, in the Beynese Oberland, affords a fine view of the High Alps rising close at hand. For a near view of Alpine scenery, among the spots which afford a concentration of the grandest objects are the valleys of the Bernese Oberland, and those which descend from Monte Rosa in Valais. In these districts the glaciers are seen to great advantage. A description of the Swiss Alpine passes, the carriage roads, including those recently opened, and the railway over the St. Gothard pass now (187G) in course of construction, is given in Alps. Of the Alpine defiles, the ravine of the Via Mala, on the upper Rhine in Grisons, is one of the most sublime scenes. The gorge of the Schollenen on the St. Gothard, that of Gondo on the Simplon, and the glen in whose depths the baths of Pfafers are sunk, also deserve mention. The glaciers of Switzerland are the reservoirs which feed some of the largest rivers of western Europe, including the upper Rhine, which flows within and along the boundary line of Switzerland, and then enters Germany, and the Rhone, which rises among the glaciers of the St. Gothard range near the Furca, receives the Visp, Borgne, and Dranse, and on quitting the canton of Geneva becomes a French river. The next largest river in Switzerland is the Aar, which rises in the Bernese mountains, receives the Saane, Reuss, and other affluents, and carries the waters of 14 cantons to the Rhine. The Ticino flows through the canton of that name, and passes through Lago Maggiore into Italy; and the Inn waters a part of the canton of Grisons. There are numerous waterfalls, among which are the fall of the Aar, at Handeck, in the canton of Bern; the Staubbach or Dost fall, in the Bernese Oberland; the Giesbach, on the lake of Brienz; the fall of the Sallenche, known as the Pissevache, near Martigny,Valais; Reichenbach falls, near Meiringen, Bern; the fall of Pianaz-zo, on the Splugen, Grisons; the Tourtemagne fall, near the Simplon road, in Valais; and the falls of the Rhine, near Schaffhausen. There are several lakes, and the more important, Bi-enne, Constance, Geneva, Lago Maggiore, Lucerne, and Lugano, are described in separate articles. - The more marked geological features of Switzerland are noticed in the articles Alps and Jura; and the glacial phenomena which have been most carefully studied, and which throw so much light upon the dynamics of geology, are specially treated in the article Glacier. No country possesses greater interest for geologists than Switzerland, whose formations are exhibited upon the grandest scale, and reveal in the most striking manner the metamorphism to which rocks are subject, converting strata of comparatively recent formation into schistose and crystalline rocks; but its mineral resources, including iron, lead, and copper, are of no great importance. Anthracite of inferior quality is found in several places. The salt mines near Basel and those at Bex (Vaud) are the most important. Gypsum is found with the salt, and slate is extensively quarried. There is a large number of mineral springs, many of which are famous as watering places. The most celebrated are Leuk (Valais), St. Moritz in the valley of Engadine (Grisons), Pfafers (St. Gall), and Baden and Schinznach (Aargau). - The climate is more severe than might be expected from the geographical position of Switzerland. On the highest summits snow and ice are perpetual. On the lower mountains and the table land snow falls in greater abundance than in other countries of the same latitude in Europe. In Valais the fig and grape ripen at the foot of ice-clad mountains, while near their summits the rhododendron and the lichen grow at the limit of the snow line. Ticino has the climate of Italy, yet the weather is more changeable. Switzerland on the whole is very healthful, with the exception of a few places in swampy or very narrow and deep valleys. In the middle ages the country of the Jura suffered much from earthquakes, which have entirely ceased for several centuries; but floods, avalanches, and snow storms still threaten the inhabitants with frequent dangers. About two thirds of the surface consists of lakes and other waters, glaciers, naked rocks, and other uninhabitable heights. Some districts are very fruitful, yet the grain raised is not sufficient for the supply of the population. The vine is cultivated on the slopes of the Jura and in the valleys of the Rhine, Rhone, Reuss, Limmat, and Thur, and in some places ripens at 2,000 ft. above the sea. The annual production is valued at about $6,000,000. Flax and hemp are extensively grown. Irrigation is judiciously managed, and in general agriculture is making progress. The forests cover about 17 per cent, of the soil, and although their cultivation is imperfect, the production of timber exceeds the home consumption. Fishing still yields considerable produce, but hunting is not practised to the same extent as formerly, and in some of the cantons it is forbidden by law. Chamois are still found in the Alps; other animals are bears, wolves, wild boars, and roebucks; foxes and hares are numerous, and otters are found in some of the lakes. Switzerland is celebrated for its rich and excellent pastures; the finest breeds of cattle are those of the Simmenthal and Saanen (Bern), Gruyere (Fribourg), Zug, and Schwytz. In 1866 there were 993,000 horned cattle (about one fourth milch cows), 100,000 horses, 447,-000 sheep, 375,000 goats, and 304,000 swine. The sheep and swine do not supply the home demand. The best cheese is made in Gruyere and in Urseren (Uri), and in the valleys of the Emmen, Saane, and Simmen. - While Switzerland is mainly agricultural, certain classes of manufactures are prosperous and important. The chief seats of the cotton manufacture are Aargau, Appenzell, St. Gall, Zug, and Zurich. The number of mills in 1870 was 168, and of spindles 2,059,350, employing 20,000 operatives, besides 38,000 hand-loom weavers. This estimate includes 6,000 workers in Appenzell and St. Gall employed in the manufacture of embroidery alone, to the annual value of $2,000,-000. Basel employs 6,000 persons in the manufacture of silk ribbons, to the annual value of $7,000,000, and 12,000 operatives in Zurich make silk stuffs of the annual value of $8,000,-000. In Bern, Geneva, Neiifchatel, Solothurn, and Vaud 36,000 persons produce annually 1,600,000 watches, valued at $17,600,000. The movements of many of these are exported to be cased in other countries. Wood carving is carried on in most of the cantons. Vaud produces annually 80,000 musical boxes. 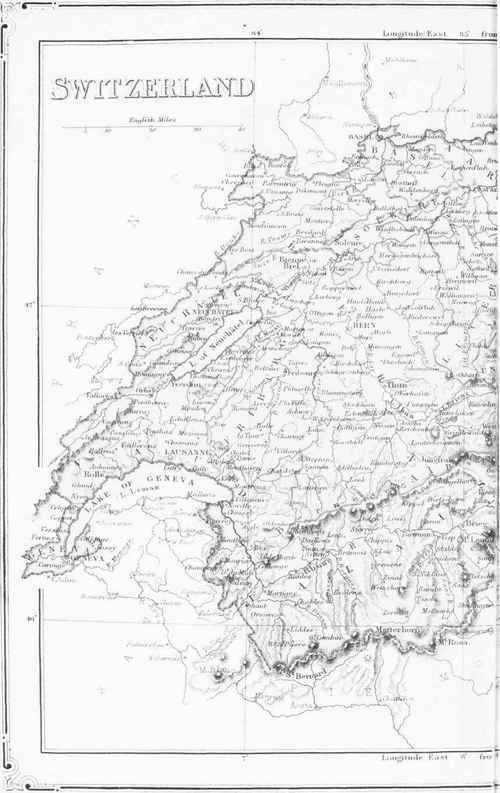 Fourteen of these divisions have capitals of the same names; those of the remaining eleven are as follows: Aargau, Aarau; Appenzell Outer Rhodes, Trogen and Herisau, alternating; Basel Country, Liestal; Grisons, Coire; Thurgau, Frauenfeld; Ticino, Lugano, Locarno, and Bellinzona, alternating; Upper Unterwalden, Sarnen; Lower Unterwalden, Stanz; Uri, Altorf; Valais, Sion; Vaud, Lausanne. Of the entire population 94.3 per cent, were natives, and 5.7 foreigners, including 63,000 Germans, 62,000 French, and 18,000 Italians. The number of communes in 1870 was 3,052, of which 5 had a population of more than 20,000, 7 from 10,000 to 20,000, 31 from 5,000 to 10,000, and 251 more than 2,000. The number of houses was 387,148, and of families 557,018. The excess of females over males was about 59,500. The number of births in 1871 was 81,629, and of deaths 77,998. The population has increased since 1816 about 50 per cent., more slowly than that of the United States and Great Britain, but in a much larger ratio than that of France. Geneva, Basel, and Neufchatel have increased nearly 100 per cent. ; Lucerne and Bern more than 50; Zurich nearly 50. Since 1860 every canton except Appenzell Inner Rhodes shows an increase of population. Of the entire population in 1870, 1,095,447 were wholly or partly supported by agriculture; the manufactories employed 216,468, and the handicrafts 241,425. The difference of language points to the difference of origin of the inhabitants of the several cantons. The N., N. E., and central cantons speak a German dialect; French prevails in Vaud, Geneva, and Neufchatel, and in parts of Valais, Fribourg, and Bern; Italian in Ticino and in a part of Grisons; and Romansh, a corrupted dialect of the Latin, in a part of Grisons. The population speaking these four languages is classified by the census of 1870 as follows : German is spoken in 384,538 families, French in 133,-575, Italian in 30,079, Romansh in 8,778, and other languages in 48. A majority of the inhabitants are Protestants, but the Roman Catholics are most numerous in 11 cantons and one half canton, viz. : Appenzell Inner Rhodes, Fribourg, Geneva, Lucerne, St. Gall, Schwytz, Solothurn, Ticino, Unterwalden, Uri, Valais, and Zug. They have five bishops, viz. : of Basel, Coire, Fribourg, St. Gall, and Sion. There are also priests with the functions of prefects apostolic to minister to scattered Catholics. In 1872 the pope erected Geneva into a new diocese, but the cantonal government denounced the measure as contrary to law. In 1873 the pope made it an independent vicariate apostolic, and the bishop of Fribourg resumed the former additional title of Lausanne, but the federal council refused to recognize it. In 1873-4 several parish churches, especially in the cantons of Aargau, Bern, Geneva, and Solothurn, passed into the possession of the Old Catholics. The Jesuits and Re-demptorists are excluded by the federal constitution from Switzerland, and the number of the convents of other religious orders has been somewhat reduced during the present century; in 1874 it amounted to 88. The constitution of 1874 forbids the founding of new convents. The Protestants belong mostly to the Reformed church. Since 1857 deputies of the Reformed cantonal churches meet annually in a Helvetic conference. Faculties of Protestant theology are connected with the universities of Bern, Zurich, and Basel, and there are also several theological schools in French Switzerland; in Bern a faculty of Old Catholic theology was established in 1874. Basel is the seat of the greatest missionary and Bible society of continental Europe, while the religious societies of French Switzerland have their centre in Geneva. Free churches (Presbyterian or Independent) have been formed during the present century by secession from the state churches, and are especially numerous in the cantons of Geneva, Neufchatel, and Vaud, in each of which they have a theological school. The Methodists and Baptists have congregations in several cantons, and the former also a book concern at Zurich. In 1870 the number of Jews amounted to 6,996. - Switzerland has three full universities, at Basel, Bern, and Zurich. The former was founded in 1460, the .two latter since 1832. All are organized after the model of the German universities, governed by a rector and a senate, and divided into faculties, of which Basel has four, Zurich five, and Bern six. There are also four academies, at Geneva, Lausanne, and Neufchatel, each with three faculties, and Fribourg with two faculties; three lyceums, at Lugano, Ein-siedeln (Schwytz), and Sion; and nine theological schools. The academy at Geneva (called also university), founded in 1368, the scene of Calvin's and Beza's teaching, has hitherto lacked a medical faculty. This will soon be added, completing the university. All the academies except that of Fribourg are Protestant, all the lyceums Catholic. The number of gymnasia and cantonal schools is 47. The federal constitution of 1848 provided for the establishment of a federal university (the three above mentioned being cantonal institutions); but the conflicting claims of several cantons as to its location, and of the Reformed and Roman Catholic churches as to its organization, have prevented the execution of the plan. A federal polytechnic school was founded in 1854 at Zurich, and has attained a high degree of prosperity and celebrity. In 1874 it had 73 professors and 676 students, and 275 pupils who study one or more branches at their option. The number of public schools amounts to about 7,000, educating upward of 400.000 pupils. There is a federal military academy at Thun (Bern). The expenses of public instruction are partly paid by the communities, partly by special school funds, and partly by appropriations of the cantonal governments; and the constitution requires that all children must attend school from their 7th to their 14th year. Many private educational institutions have gained a world-wide celebrity since the days of Pestalozzi and Fellenberg, who conducted establishments of this kind at Yver-dun (Vaud) and Ilofwyl (Bern). Considerable attention is given to musical instruction, and in 1874 the federal singing societies numbered 8,552 members. The Alpine valleys are remarkable for their peculiar local melodies. (See Ranz des Vaches.) The number of periodicals published in Switzerland in 1872 was 412, of which 266 were in German, 118 in French, 16 in Italian, 5 in Romansh, 1 in English, and 6 in German and French. The aggregate number of copies issued was 90,800,-000. - The first federal constitution of Switzerland, which superseded the federal contract of Aug. 7, 1815, and changed the federal union of states into a federal republic, was promulgated Sept. 12, 1848. A revised constitution was submitted to the people on April 19, 1874, and, having received the constitutional majority, came into force on May 29. It provides that all the rights of sovereignty which are not expressly transferred to the confederacy are exercised by the 25 cantons and half cantons. Among the prerogatives of the federal government are the rights of declaring war, of concluding peace or treaties, and of sending diplomatic representatives. The formation of separate alliances between the cantons, without special permission, is prohibited. The constitution of every canton is guaranteed, if it is republican in form, if it has been adopted by the people, and if it can be revised on the demand of a majority of the citizens. All Swiss are equal before the law, and the former relation of subjects as well as all privileges of place or birth are abolished. There shall be complete and absolute liberty of conscience and of creed. No one can incur any penalties whatsoever on account of his religious opinions. The father or guardian has the right to dispose of the religious education of the children up to the age of 16 years. No one is bound to contribute to the expenses of a church to which he does not belong. The free exercise of worship is guaranteed. Civil marriage is compulsory, and a subsequent religious ceremony is optional. The cantons have the right to maintain peace and order between different religious communities, and to prevent encroachments of ecclesiastical authorities upon the rights of citizens. No new bishoprics can be created without the approbation of the federal government. Liberty of the press, of petition, and of association is guaranteed; but the Jesuits and all religious orders and associations which are affiliated to them are prohibited; all functions, clerical and scholastic, are forbidden to Jesuits, and this interdiction can be extended to any other religious order whose action may be deemed dangerous to the state. The confederacy has the right of sending away dangerous foreigners. The legislative power is vested in the federal assembly, which consists of a national council and a council of states (Ger. Stande-rath; Fr. conseil des Stats). The national council consists of deputies of the people, in the ratio of about one for every 20,000 persons, so that every canton and every independent half canton has the right of electing at least one councillor. On the basis of the census of 1870 the council consists of 135 members. The national council is elected for the term of three years, and every citizen who is 20 years of age has the right of voting, and any voter, not a clergyman, is eligible. Naturalized citizens may be elected after being citizens for five years. The council of states has 44 members, two for every canton and one for every half canton. The members of the national council are paid out of the federal treasury, those of the council of states by the cantons. The executive power is exercised by a federal council, consisting of seven members, who are chosen for a term of three years by the federal assembly (the national council and the council of states in joint session). They divide among themselves the seven departments of foreign affairs, of the post and telegraphs, of justice and police, of finance, of war, of the interior, and of commerce and duties, each member taking one department and being at the same time the substitute in a second department. The president and vice president of the federal council, who are also president and vice president of the confederation, are chosen for one year only, and by the council itself from among its own members, and are not reeligible till after the expiration of another year. The federal court, which is also chosen by the federal assembly for a term of six years, consists of nine members and nine substitutes, and has its seat at Lausanne. The constitution may at any time undergo a revision in the regular way of legislation; if the two councils disagree, or if 50,000 citizens demand it, the question of a revision has to be submitted to a direct vote of the people. The revised constitution, in order to become effective, must be adopted by a majority of all citizens of Switzerland as well as by a majority of the cantons. The cantonal constitutions may be divided into two classes: 1. Pure democracies, in which the rights of sovereignty are exercised by a general assembly of all citizens, which meets once a year, mostly in April or May, votes upon laws, fixes the taxes, and elects the cantonal officers. The executive is called Landrath, and consists of the cantonal officers and the councillors elected by the several political communities. This is the constitution of Uri, Appenzell, Unter-walden, and Glarus. 2. Representative democracies, in which the people elect a legislative assembly, called the grand council, which chooses from its own number the executive, called little council. In many cantons the people have the right of vetoing every bill passed by the grand council. In most of the cantons the members of the grand council receive no pay. Instead of printed law books, some of the smaller cantons used until recently written traditions; but now nearly every canton has its printed code of laws. Many old Germanic elements are to be found in Swiss law; the Roman law has had a predominating influence only in a few border cantons. The institution of the jury, which was first tried in Geneva, has since been introduced into several other cantons. The federal capital is Bern. - The finances of Switzerland are in a very favorable condition. In 1873 the entire revenue, the greater part of it derived from duties and the postal system, was $7,152,704, and the expenditures were $7,154,-712. Since 1848 duties are levied only on the frontiers of the republic, and not, as before, on the limits of each canton. A portion of the customs dues, as well as a great portion of the postal revenue, are paid over to the cantonal governments, in compensation for the loss of such former sources of income. In extraordinary cases, the federal government may levy a rate upon the various cantons after a scale settled for 20 years. The public debt at the close of 1873 amounted to $5,650,000, and the federal property to $5,691,000. The aggregate income of all the cantons in 18G8 amounted to $8,320,000, the aggregate expenditures to $8,630,000. Schaffhausen and Appenzell Inner Rhodes had no public debt; many other cantons formerly without debt have of late contracted one for the purpose of building railways. In the majority of cantons the public property exceeds the debt. In 1868 the aggregate property belonging to the cantonal governments amounted to $54,-770,000, and the aggregate debts to only $33,-660,000. - The military establishment of Switzerland is based upon purely democratic principles. The fundamental laws of the republic forbid the maintenance of a standing army within the limits of the confederation. Every able-bodied citizen is actually a defender of the republic. The federal army consists of citizens from 20 to 44 years of age, and is divided into three classes according to age. The first class, comprising men from 20 to 34 years of age, constitutes the active field army; the second class, 34 to 40 years, the reserve army; and the third class, 40 to 44 years, the sedentary militia. The constitution of 1874 considerably extends the federal control in military matters. Both the army and the war material are at the disposal of the confederation, which in cases of emergency has the exclusive right to dispose of the men who do not belong to the federal army. All the laws relative to the army are enacted by the confederation, which also provides for the education of the troops. The Thun military academy furnishes the army with the highest class of officers and with instructors for the lower grades. There are special schools for different branches of the service, especially for the artillery and riflemen. All the different classes are required to devote a certain number of days in each year to battalion and brigade drills and field manoeuvres. The Swiss are accurate marksmen with the rifle, and meet constantly to practise and engage in trials of skill. There are clubs and societies in almost every valley and parish, and frequent matches; besides which a federal rifle match is held every year. The number of riflemen in the army list of 1874 was 13,918. Annual contests in wrestling also are held in many parts of Switzerland. In September, 1874, the field army numbered 84,369 men, the reserve army 50,069, and the militia 65,981; making, with administrative troops and the sanitary corps, a total of 201,257. - The first inhabitants of Switzerland are supposed to have been of Celtic origin, and to have immigrated from the northeast. Their collective name was Helvetians. (See Helveth.) The high valleys near the sources of the Rhine, in the present canton of Grisons, were occupied by a tribe akin to the Tyrrhenians or Etruscans, called the Rhaatians. In 113 B. C. two tribes of Helvetians, the Tigurini and Tugeni (from which are derived the names of Zurich and Zug), joined the Cimbri and Teutons in their inroads into Italy. In this war the Helvetian Divico, in 107, completely routed the Romans under their consul L. Cassius Longinus. After the defeat of the Cimbri in 101, the Helvetians returned unmolested to their mountains, followed, it is believed, by the scattered remnants of the Cimbri, to whom the foundation of the town of Schwytz is ascribed. In the time of Caesar an entire tribe of the Helvetians, instigated by their leader Orgetorix, determined to conquer scats in Gaul, destroyed their towns and villages, and under the command of Divico crossed the Saone; but they were conquered by Caesar at Bibracte (Autun), and driven back to their country. Soon afterward the Helvetian tribes were gradually subdued by the Romans, and even the Rhaetians, who were the last to maintain their freedom, were compelled at length to yield. For several centuries Switzerland remained a province of the Romans, who introduced their manners, laws, and civilization, and founded several towns, as Augusta Rauracorum (Augst, near Basel), Curia Rhaatorum (Coire), Vindonissa (Windisch, in Aargau), Aventicum (Avenches, in Vaud), and Eburodunum (Yverdun). In the 2d, 3d, and 4th centuries the country was often harassed by the invasion of German tribes, especially the Alemanni; the Celtic and Roman elements of the population mostly perished, the towns were sacked, and the country laid waste. In the 5th century the Burgundians, Alemanni, and Goths divided the country among themselves; but their dominion was short, and in the 6th century they were all brought into subjection by the Franks. Christianity, which had already begun to take root in Burgundian Switzerland, became under the rule of the Franks the religion of the entire country. Many bishoprics and convents were founded, and the bishops and many abbots obtained great political influence. Though wholly incorporated with the empire of the Franks, the country was in point of administration divided into two parts: the one, extending from the lake of Constance and the Rhine to the Aar and St. Gothard, was called Rhaetia and Thurigau; and the other, comprising the present cantons of Geneva, Valais, Neufchatel, Bern, Fribourg, Solothurn, etc, was called Little Burgundia. Under the weak reign of Charles the Fat (died 888), Switzerland, like many other parts of the empire, was lost to the Franks. The N. part came into the possession of the duke of Alemannia (Swabia), and thus became part of the German empire, while the S. part belonged to Burgundy. During the invasion of Germany by the Hungarians in the 10th century, many towns, as St. Gall, Basel, Zurich, and Lucerne, were fortified, and rose in importance. During the reign of the emperors of the house of Saxony the country was mostly held as fiefs by the vassals of the empire, in particular by the bishops and abbots, the counts of Kyburg (Zurich), Hapsburg and Lenzburg (Aargau), and Rapperswyl and Toggenburg (St. Gall); later also by the count of Savoy and the duke of Zahringen. Many of these noble families became extinct during the crusades; and the power and prosperity of the towns rose still higher, Bern and Fribourg even becoming free cities of the German empire. Zurich, Bern, and Basel formed an alliance, and tried to make themselves independent. Yet the independence of Switzerland did not proceed from them, but from the three ancient cantons of Sclnvytz, Uri, and Unterwalden, the inhabitants of which are believed to have descended from immigrants from Sweden, and which had never been conquered. They were only under the protection of the German emperor, near whom their rights were guarded by a vogt, first a count of Lenzburg, and afterward a count of Hapsburg. The elevation of Rudolph of Hapsburg to the imperial throne of Germany in 1273, and his conquest of Austria and other possessions of Ottocar of Bohemia, greatly increased the influence of the house of Hapsburg in Switzerland. Albert, the son of Rudolph, sought to incorporate the Swiss with Austria. Bern and Zurich at once resisted successfully; but in Schwytz, Uri, and Unterwalden he succeeded for a time. The convention entered into by 33 distinguished men of the three cantons on the Grtitli or Rutli, a meadow on their common frontier, during the night of Nov. 7-8, 1307, led, on Jan. 1, 1308, to the expulsion of the Austrian officers and the destruction of their castles. The legend of Tell belongs to this period. The relation of the three cantons to the German empire remained at first unchanged; but the war of Austria for reestablishing its rule in the emancipated cantons, which lasted with many interruptions for about 200 years, ended with severing also the ties which bound Switzerland to Germany. The Hapsburgs also lost their possessions lying between the Alps and the Rhine, and their old family castles of Hapsburg and Ky-burg. The league of the three old cantons, which had first been formed in 1291 and renewed in 1308, was again established as a perpetual confederacy in 1315, after the great victory over the Austrians at Morgarten on the confines of Schwytz and Zug. In 1332 Lucerne joined the confederacy, which received the name of the Four Forest Cantons ( Vierwalihtatte). Zurich came in in 1351, Gla-rus and Zug in 1352, and Bern in 1353, when the eight united cantons erected the "perpetual league of the eight old places of the confederacy," so called because no new members were added to the confederacy till 1481, and these eight. enjoyed many privileges till 1798. Other victories over Austria were gained at Sempach (Lucerne), July 9, 1386, and at Na-fels (Glarus), April 9, 1388; after which the Swiss became aggressive, and at length, notwithstanding their defeats at Arbedo (Ticino) in 1422 and at St. Jacob (Basel) in 1444, annexed a considerable portion of Austrian territory. These protracted conflicts awakened such a fondness for warfare that many Swiss soldiers entered foreign armies, where until a very recent period they earned the questionable reputation of being the most loyal defenders of the cause which they espoused, even if it were that of despotism. Foreign enlistment without permission was forbidden by the federal government in' 1860. There were occasional internal dissensions, and Zurich from 1440 to 1450 seceded from the con-.federacy. As at this time Schwytz had a predominant influence in the councils of the confederacy, its cantonal colors (white and red) were adopted as the confederate ensign, and the party name Swiss (Schwytz) became the designation of the entire people. In 1475 the cantons joined France, Austria, and some of the Alsatian free towns in the league against Burgundy. The Swiss gained a great victory over Charles, duke of Burgundy, at Granson, in March, 1476; the confederates annihilated his army at Morat in June; and the war terminated with the defeat and death of the duke at Nancy in January, 1477. (See Charles The Bold.) The admission of Solothurn and Fribourg into the confederacy in 1481 threatened a civil war, which was averted by the exhortations of the hermit Nicholas von der Flue. Other internal dissensions were terminated by a war against the German emperor (1498), which was concluded by the peace of Basel in 1499, and Basel and Sehaffhausen, for faithful assistance, were admitted as members of the confederacy, to which Appenzell was added in 1513. The number of cantons thus rose to 13, and remained so till 1798. The Swiss conquered Lombardy for Duke Maximilian Sforza in 1512, and routed the French at Novara in 1513, but in 1515 lost the great battle at Marignano. They found France willing to conclude with them an advantageous peace in 1516, which was kept till 1798. The reformation of the 16th century led to open war between the Reformed and Catholic cantons, but soon after the battle at Cappel (Zurich) in 1531 peace was concluded, and every canton left at liberty to introduce or to oppose the reformation. (See Reformation, vol. xiv., pp. 246-'7.) Geneva freed itself, with the aid of Bern, from Savoy, and in 1536 became a Protestant republic, but without being admitted into the confederacy. Vaud was conquered by Bern from Savoy in 1536 and reformed; but on the other hand, the Catholic cantons of Lucerne, Uri, Schwytz, Unterwalden, Solothurn, and Fribourg formed in 1586, by the advice of Archbishop Charles Borromeo of Milan, the "golden league" for the common defence of the Catholic religion. The religious split long continued a prolific source of dissension between the cantons. In 1597 the canton of Appenzell, in order to prevent a religious war, was separated into two independent half cantons, the Catholic part being called Inner 'Rhodes, and the Reformed Outer Rhodes. In 1602 the Reformed were expelled from Valais, and in 1620 Protestantism was forcibly suppressed in the Valtellina. In Grisons a bloody civil war was kindled, in which other cantons also took part, and which made the country one of the chief seats of the war between France, Spain, and Austria. As the federal courts of Germany still made claims on Switzerland as belonging to the German empire, the Swiss sent the burgomaster Weltstein of Basel as their representative to the peace congress of Munster, which at the peace of Westphalia (1648) pronounced Switzerland entirely independent of Germany. From this time until the outbreak of the French revolution in 1789, the history of Switzerland presents few events of general importance. It had no foreign war, and the occasional religious contests at homo were generally of short duration. The most important of them was the second war of Toggenburg in 1712, when 150,000 Swiss were in arms against each other. Other internal commotions arose out of the oligarchic form of government which was gradually established in the cantons of Bern, Fribourg, Solothurn, and Lucerne, and out of the oppressed condition of the subjected territories whose inhabitants were excluded from all political rights. In 1798 two French armies marched, without any respectable pretext, into Swiss territory, captured on March 5 the city of Bern, plundered its armory and treasury, and on April 12 proclaimed at Aarau the one and indivisible Helvetic republic, divided into 18 cantons, with Aarau as the federal capital. 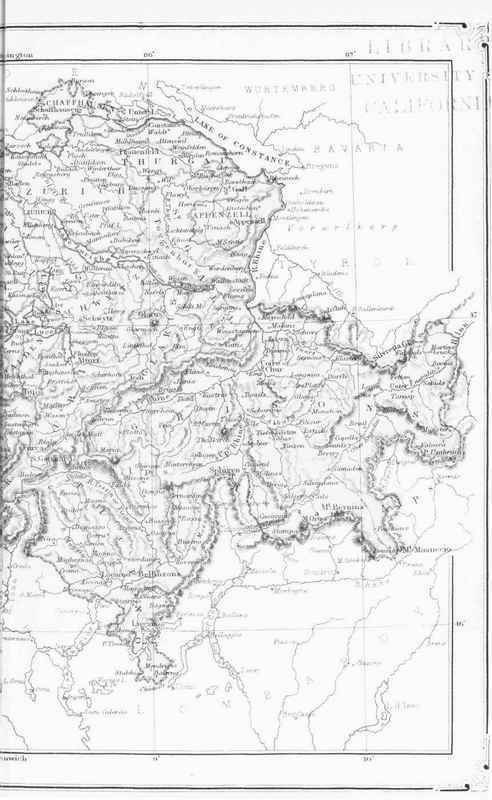 By the new constitution Bern was divided into four cantons, the subjected districts of Baden, Thur-gau, Lugano, and Bellinzona were erected into cantons, Zug, Uri, Schwytz, and Unter-walden united into the one canton of the Forest Towns, and Appenzell, St. Gall, and the valley of the Rhine formed into the canton of Sentis. Geneva, Bienne (Bern), and several other portions of Swiss territory were incorporated with the French republic. The resistance of the old forest cantons proved useless, and the new constitution was gradually introduced. Overthrown on the entrance and advance of the allied armies under the command of Suvaroff, it was reestablished after the victories of the French under Massena. The withdrawal of the French troops in 1802 led at once to revolutions in almost every canton, and a general diet, consisting of an equal number of deputies from the formerly governing and the governed districts, was convoked at Schwytz; but again France interfered, 12,000 French troops subdued the old cantons, and deputies from all the cantons were ordered by Bonaparte to assemble at Paris for the purpose of reorganizing Switzerland. On Feb. 19, 1803, Bonaparte transmitted to them the act of mediation, by which the former cantonal system was restored, although the relation of subjected territories remained abolished. To the 13 old cantons 6 new ones were added, viz. : St. Gall and Grisons, which had formerly been allied with the confederacy without being members, and Aargau, Thurgau, Ticino,and Vaud, which had been subjected territories. At the head of the confederacy was again placed a diet (Ger. Tagsatzung), consisting of commissioners, voting according to instructions. It was to assemble in turn in the cities of Bern, Zurich, Lucerne, Basel, Fribourg, and Solo-' thurn, and the burgomaster of the temporary capital (Ger. Vorort), under the name of Lan-dammann of Switzerland, was to preside at the diet and to attend to all the current affairs of the year. In the democratic cantons the sovereign popular assemblies were reestablished; in the others grand and little councils, the former being elected by a direct vote of the people, and the latter by the grand council. This new constitution was on the whole well received, and under it Switzerland for ten years enjoyed peace at home and abroad. After the battle of Leipsic the troops of the allied powers marched through Switzerland. Bern and others of the aristocratic cantons severed their connection with the Helvetic government instituted by the act of mediation, and civil broils ensued in a number of cantons. Yet the attempt to restore the former order of things had soon to be given up, and a new constitution, adopted by the federal diet on May 27, 1815, and sworn to at Zurich on Aug. 7, acknowledged all the 19 cantons constituted by the .act of mediation, and added three new ones, Geneva, Valais, and the Prussian principality of Neufchatel. This constitution was ratified by the great powers of Europe, which also declared the perpetual neutrality and inviolability of the confederation (Nov. 20). The territory of Switzerland was enlarged by portions of land ceded by France (the Dappes valley), Savoy (Carouge and several villages on the lake of Geneva and on the Rhone), and Austria (Rhazuns, the Frick-thal, Laufenburg, and Rheinfelden). The cantons of Solothurn, Grisons, Schwytz, and Appenzell Inner Rhodes adopted the constitution only with reluctance, and Nidwalden (one half 0r Unterwalden) had to be coerced into submission by force of arms. According to the new confederation the cantons guaranteed to each other their constitution, and united for the common defence of their independence. The diet was to assemble annually on June 1, alternately at Bern, Lucerne, and Zurich, and to it was reserved the right of declaring war, concluding peace, and forming alliances with foreign powers. The cantons retained the right of forming with foreign states special military agreements. The existence of the convents and cathedral chapters was guaranteed by a special article. The administration of federal affairs, during the time that the diet was not in session, was left to the temporary capital. In 1817 Switzerland, on the invitation of Alexander of Russia, joined the holy alliance, and from 1823 to 1828 it conceded to the urgent requests of the great powers of Europe a restriction of the liberty of the press and of the right of asylum. The aristocracy recovered in most cantons part of their former prerogatives, and several capital towns greatly enlarged their influence at the expense of the country people. The French revolution of July, 1830, led to violent political agitations in Switzerland. In several cantons the country people rose against the capital towns, and forced them to reorganize the cantonal constitutions on a more liberal and democratic basis. In the canton of Basel a permanent division into two independent half cantons, Basel City and Basel Country, was effected in 1832. In November some of the most conservative cantons, Uri, Schwytz, Un-' terwalden, Neufchatel, and Basel City, formed the " league of Sarnen," and threatened to send no more commissioners to the federal diet if the commissioner from Basel Country were admitted. The federal diet interfered; the separate league was declared dissolved, and the refractory cantons had to submit to the federal authority. Altogether, liberal cantonal reforms were introduced in about two thirds of Switzerland. Encouraged by success, the progressive party conceived also the plan of revising the federal constitution, with the view of effecting a closer political union. The diet, on July 17, 1832, pronounced in favor of. the revision; yet, when the amendments adopted by the diet were subjected to a direct popular vote, they were voted down by a coalition of the Catholic and radical parties. The large number of political refugees, who gathered in Switzerland in consequence of the revolutionary movements of 1830, involved the country in serious difficulties with the great powers, which complained of the liberty granted to them by the federal diet. The latter endeavored to conciliate the powers by several resolutions restricting the liberty of the refugees (in 1834 and 1838), and even by the expulsion of some of the leading men among them (1836); yet the diplomatic collisions continued. The demand of the French government in 1838 for the expulsion of Louis Napoleon, who had been since 1832 a citizen of the canton of Thurgau, was declined by Switzerland, and almost led to a war, which was only avoided by his voluntary departure. An occasion for new religious contests was given by the conference at Baden in 1834, at which delegates of Bern, Basel Country, Aargau, Thurgau, Lucerne, Solothurn, and St. Gall undertook to regulate the relations of the Roman Catholic church in a manner which was rejected by the pope and the bishop of Basel as contrary to the rights and the spirit of the church. The articles of the conference provoked several insurrections, especially in the canton of Aargau, the government of which, to punish the revolted Catholic districts, decreed in 1841 the abolition of all the convents. Against this measure most of the Catholic cantons and the ambassador of Austria protested, as a direct violation of that article of the constitution of 1815 which guaranteed the continuance of convents and chapters. Upon the representations of the federal diet Aargau restored four female convents, a concession which did not satisfy Austria and the Catholic cantons; but the federal diet by 12 1/3 votes dismissed the subject from its docket (Aug. 31, 1843). A cause of still greater trouble was a motion, made by Aargau at the diet of 1844, for the expulsion of the Jesuits from Switzerland. It was laid on the table by the diet; but when the Catholic Vorort Lucerne resolved (Oct. 24, 1844) to call the Jesuits to a cantonal institution, a great excitement spread throughout Switzerland. Two volunteer expeditions (December, 1844, and March, 1845) were undertaken for the purpose of overthrowing the government of Lucerne, but both were unsuccessful. On the other hand, the governments of Vaud, Born, and Zurich, which had voted against the expulsion, had to give way to others which were in favor of the project. As thus the danger threatening the existence of the schools of the Jesuits increased, the cantons which either had called Jesuits to cantonal institutions, or which patronized them (viz., Lucerne, Uri, Schwytz, Unterwalden, Zug, Fribourg, and Valais), strengthened a separate alliance (Son-derbund) which had already been formed in 1843, and appointed a council of war for the emergency of a civil contest. A motion of Zuirich at the diet of 1845 to declare the Son-derbund dissolved received only 10½ votes, but a change of government of Geneva and St. Gall secured for the motion a majority of 12½ votes on July 20, 1846. One Protestant canton (Neufchatel), one Protestant half canton (Basel City), and one Catholic half canton (Appenzell Inner Rhodes) voted with the cantons of the Sonderbund. In September another resolution declared the expulsion of the Jesuits from all Switzerland. The diet collected an army of nearly 100,000 men under the command of Gen. Dufour, and on Nov. 4 resolved to execute the decree of July 20 by force of arms. The Sonderbund had raised a force of 36,000, which was to be supported by a Landsturm of 47,000 men. The isolated Fribourg was first attacked, and surrendered after an insignificant skirmish. On Nov. 23 the army of the Sonderbund was routed at Gislikon, near the frontier of the canton of Lucerne, the council of war, the government of Lucerne, and the Jesuits fled, and all the seven cantons submitted. In this war Lucerne was the head and centre of the seven Catholic cantons. Austria, France, and Prussia had openly declared during the war their sympathy with the Sonderbund, and in 1848 issued a joint note to Switzerland, demanding that the cantons of the Sonderbund be evacuated, and no change be made in the constitution of 1815, except by the consent of all the cantons. But the revolutions of 1848 drew off the attention of the great powers from Switzerland, and gave the latter an opportunity to hasten a thorough reformation of the federal constitution. The committee of revision began its labors on Feb. 17, 1848, and on June 27 the draft of the constitution was submitted to a direct vote of the people. A majority of the cantons and a large majority of the total population voting in favor of it, it was promulgated Sept. 12. In the same year the canton of Neufchatel declared itself independent of Prussia, which entered against this act an inefficient protest. On Sept. 2, 1855, the royalists of Neufchatel made an attempt to overthrow the government of the canton and to reestablish the sovereignty of the king of Prussia. The movement was at once suppressed (Sept. 3), but led to serious complications with Prussia, which demanded the unconditional pardon of the captured royalists. The demand was supported more or less by all the great powers of Europe; and when the federal council refused to accede to it, Prussia broke off diplomatic relations, and made some warlike demonstrations. When, however, France and England promised their intercession with Prussia in behalf of a recognition of the independence of Neufchatel, in case Switzerland would release the royalist prisoners, their advice was followed by the federal council. Prussia in 1857, at a conference of the great powers in Paris, resigned for ever its claims to Neufchatel. In 1860 Switzerland protested against the annexation of Savoy to France, as a violation of the treaties of 1564 and 1816, by which the neutrality of the districts of Chablais and Faucigny had been guaranteed. It demanded from France the cession of these two districts, but as it received little aid from the great powers, its representations were of no effect. The boundary question between Switzerland and Italy, submitted to the arbitration of George P. Marsh, United States minister to Italy, was decided on Sept. 23, 1874, in favor of Italy, definitely fixing the Swiss frontier at the point called the Cravaviola Alps, and was promulgated as obligatory on the two countries, June 11, 1875. In 1875 Switzerland and Italy concluded a new commercial treaty for ten years. - The principal works on the history of Switzerland are: Geschiclite der schweizerischen Eid-genossenschaft, by Johannes von Muller and others (7 vols., 1780-1829), to the end of the 16th century, continued in a French translation by Monnard and Vulliemin to the 19th century (19 vols., Paris, 1837-51); Heinrich Zschokke's Geschiclite des Schweizerlandes (Zurich, 1822; English translation by Francis George Shaw, embracing Emil Zschokke's continuation to 1848, New York, 1855; new ed., 1875); Bluntschli's Geschiclite des schweizerischen Bundesrechts (2 vols., Zurich, 1846-'52); and A. Morin's Precis de l'histoire politique de Suisse (5 vols., Geneva, 1855-75). Switzerland, a S. E. county of Indiana, bordering on Kentucky, from which it is separated by the Ohio river; area, 220 sq. m.; pop. in 1870, 12,134. The surface is undulating and the soil fertile. The chief productions in 1870 were 132,865 bushels of wheat, 15,020 of rye, 309,183 of Indian corn, 27,970 of oats, 126,116 of potatoes, 19,446 tons of hay, 20,964 lbs. of wool, 174,821 of butter, and 17,342 gallons of sorghum molasses. There were 3,526 horses, 2,626 milch cows, 3,225 other cattle, 8,473 sheep, and 9,407 swine; 7 manufactories of carriages and wagons, 7 of cooperage, 1 of woollen goods, 6 flour mills, and 8 saw mills. Capital, Vevay.